Having played and loved Zombicide I decided to revisit a beloved board game from my childhood; HeroQuest. I remember as a kid playing this in my garage with friends, it always seemed so fantastic, especially as I didn't own the game at the time. I have sometimes been criticised for going a bit too far down the geek hole on this blog, this is one of those times! In HeroQuest you play as either one of four heroes or the evil sorcerer Morcar. The heroes include the strong barbarian, the weak wizard who has access to magical spells, the dwarf who can dismantle traps and the elf who is an average fighter and spell caster. These four are pretty well balanced and give some variation in abilities. Morcar is not actually a character but whoever plays this role gets to basically be the dungeon master; able to control the monsters the heroes fight as well as see the layout of the board. There are 13 quests included with the game, most of which have you needing to travel into a dungeon, retrieve or kill something and then make your escape. Each quest has its own board layout that only the dungeon master can see, the board has a layout of rooms that doors are used to access. Any part of the board nor used is sealed off with rock slides. There are a few alternate quests that spice things up such as mellowed maze in which you teleport around the board based on dice rolls and one in which you start off in prison with no items . Heroes are represented by plastic miniatures and so are the monsters. On the undead side you get skeletons, zombies and mummies. On the living end of the scale you have orcs, fimirs and the small weak goblins. As well as all these there are also two boss style monsters in the form of the giant gargoyle and the Witch Lord. All enemies have just the one hit point but can over power with numbers and lucky dice rolls. Who the monsters attack is up to the sorcerer and so it's wise to protect your weakest members. In between quests you can spend any found gold on equipment but weirdly there isn't really that much stuff to buy and so by the time you've done a few quests there is nothing to spend your gold on which was strange I found. The door pieces and the miniatures themselves are actually a bit too obstructing when their on the board, it can be fiddly trying to fit the pieces into certain squares. This is also only playable with two to five players so no solo playing which is a shame. 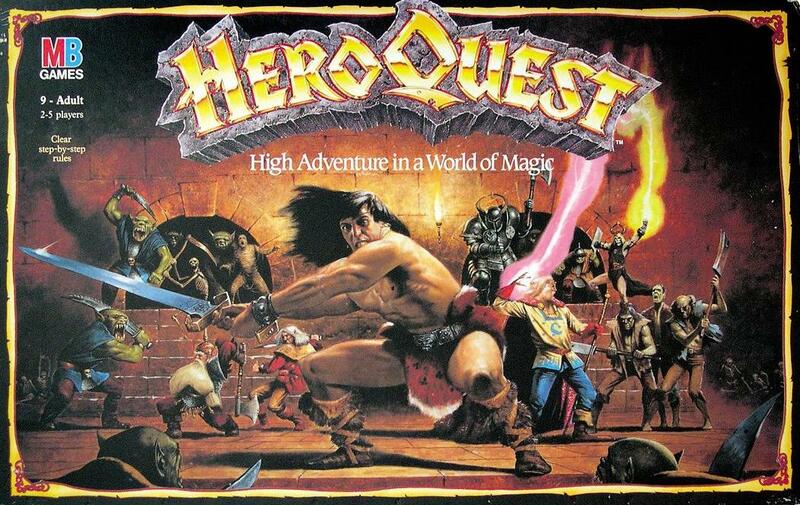 Unless you buy it from ebay you can't actually get HeroQuest as it is no longer sold in shops. Over the years it first was surmounted by Advanced HeroQuest and then by Warhammer Quest both of which introduced randomised board pieces rather than a singular board and made everything more complicated, though this game is maybe too simple at times, but then it is designed for ten years and upwards. There are six different expansion packs that give you more quests, these are quite expensive to buy now and the two North America only ones are pretty much impossible to get. I really do love HeroQuest, you just need to find the right people to play it with and a fun time is bound to be had though with just 13 quests included you will soon know the maps too well. As an added bonus the miniatures can be painted (badly in my case due to being an impatient kid when I did that). As a child I really did not appreciate how deep this game could be, or the fact that you really are meant to design your own quests to carry on the games rather than relying on the ones that come with the package.